P115LF-SS-W is rated 3.3 out of 5 by 9. Rated 4 out of 5 by howie from Decent quality for the price Easy to install the faucet. So far so good. Good water pressure. Rated 4 out of 5 by sfal1967 from Great Faucet Easy to install, Works Great, Looks Great, and A Great Price! 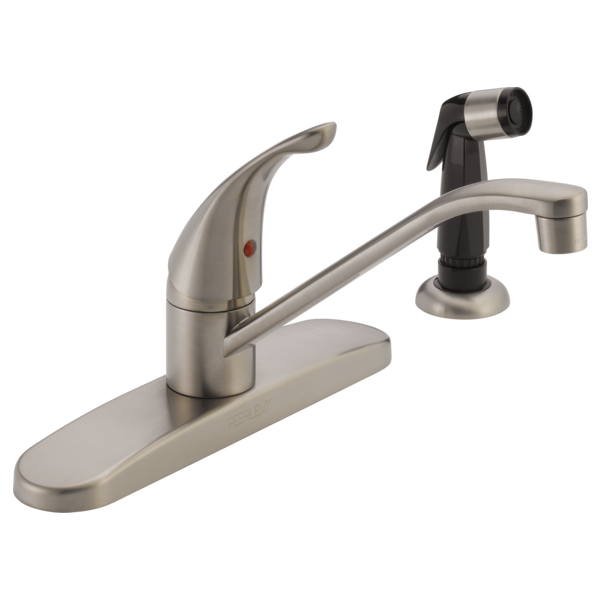 Rated 5 out of 5 by Fred198 from Good quality The faucet is working fine so far. The workmanship seems to be fine. Rated 1 out of 5 by Anonymous from this product doesn work at all installed this faucet and water will not come out the faucet. Rated 1 out of 5 by Anonymous from Bad from the start!!! Purchased this faucet from Walmart. Spent all the time and effort installing it. Turned it on and had very little water pressure and it was leaking out of the side of the neck of the spout spraying in my face. Had a small crack in it. Not the best of quality for sure. I am waiting for Walmart to open right now to take it back and get a different brand. Rated 5 out of 5 by Roy from Looks good, works well. The price was fair and it was easy to install. It was what I was looking for. The finish is listed as &quot;chrome&quot;. 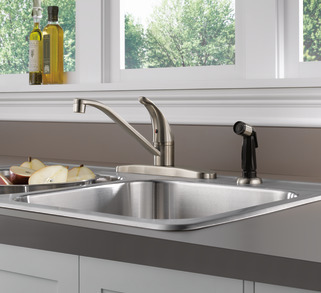 What is the faucet material? Is it chrome over plastic, stainless, cast iron, or other? How do you put the aerator parts back together? It fell apart. can I leave off the sprayer? Must I install the side sprayer when I install the faucet? Must it be installed other wise the side sprayer connector under the faucet will leak? Or can I leave if off and just use the spout? how do i take the hose off the faucet? unscrew the plastic twist bolt underneath and by popping out the 4 clips around the end of the hose and wahla it slides thru..
Why can't I use a portable dishwasher with this faucet? The water still runs for a few seconds after I shut off the faucet. How can I fix this? I turn the faucet off but the water still runs out for a few seconds and then drips for a few seconds and finally shuts all the way off. The faucet is brand new and I just put it in tonight. Is there anyway to fix this because I don't like this at all? Thanks.